Now available in Grey or White! 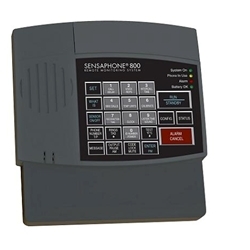 For property owners, small businesses, and more, the Sensaphone 800 offers an easy, inexpensive way to monitor a remote facility. It can be installed in any clean indoor environment to monitor a variety of applications. The 800 has a built-in ability to monitor for power failures and to detect high sound levels. There are also eight external inputs that can be connected to a variety of sensors to monitor temperature, water on the floor, humidity, and much more. One of the eight inputs comes with a temperature sensor for monitoring temperature where the 800 is installed. When an alarm is detected, the Sensaphone 800 can notify up to eight people by making voice phone calls. It will continue to make phone calls until someone responds to the call. The voice messages can be custom recorded, so you get to describe each alarm message that it speaks in your own voice. The phone interface includes a line seize feature so that extension phones are automatically disconnected when it needs to make an alarm phone call. A built-in output relay is provided to switch an external device either automatically, or manually. You can use it to have a local light or siren trip when an alarm occurs, or even to set off a local alarm when the phone line is cut or unplugged. You can even use it to control a dual setback thermostat to change the temperature remotely. Also includes nonvolatile memory and a 24-hour battery backup with user installed batteries. Can call to advise of temperature extremes (you set an acceptable range and it calls you if the temperature goes outside of that range). Unit can be called into for a status report at any time (unit recites time, current temperature, electricity status, alarm conditions, battery condition, sound level condition, and caller can listen to the room via the units built-in microphone). Detect temperature extremes in additional locations OTHER than where the Sensaphone is located FGD-0100 for indoor, FGD-0101 for outdoor, basement, refrigerator, or freezer). Detect power outages in additional locations OTHER that the Sensaphone's own location. The Sensaphone 800 CottageSitter autodialer monitors environmental conditions like temperature 24/7 to protect your vacation home or other property! You can even add a thermostat to raise and lower your temperature by phone! The Sensaphone 800 is the new and improved version of the 1108. The Sensaphone 800 can do everything that the 1108 could do, plus more! Real voice capability - Record voice labels for to identify the unit and each input! Output relay - Control a device such as a thermostat, siren, or strobe, either manually OR automatically based on alarm condition! Line Seizure - The Sensaphone 800 can seize a phone line that is in use in order to call out. Phone line condition monitoring - The 800 monitors the integrity of the phone line. If the line is cut or disconnected, and LED will flash and (optionally) the relay output can be tripped at the same time. Call or Email for quantity discount!